A classic combination of chocolate and fruit. 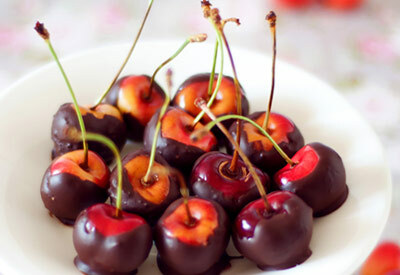 Make this easy recipe with or without pitting the cherries. By leaving the stems intact, the "handle" makes for easy eating. Using a cherry pitting device, carefully remove the pit going through the cherry cross-ways rather than from top to bottom. This will allow the stem to remain intact. The hole in the middle of the cherry will be covered with chocolate when dipped.